Blessed with a rugged and stunningly beautiful coastline, awe inspiring valleys and mountains, it truly is a golfers dream. With 1200 miles of sandy beaches, California is rightly named the Golden State, and it’s not only the surf that attracts sports lovers. From the mountains to the desert, each region in California boasts their own unique golf experience. With some of the most exceptional natural settings in the world - where you might find it hard to keep your eye on the ball rather than the view. 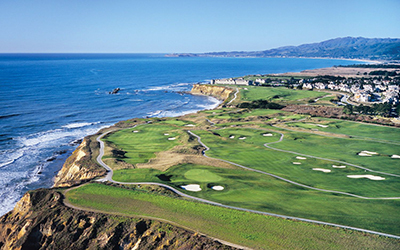 California rightfully earns its place as a premier golf destination. It is a golfer’s paradise – with pleasant temperatures year-round, where winters are mild and moderately wet, and summers are warm - the green is always calling. Golf in the Golden State is plentiful, wonderful, and remarkably varied. California is the nation’s No.2 golfing state with nearly 1,000 courses, trailing only Florida with more than 1100 courses. With hundreds of public access facilities and resorts across the state, head to California to golf near the ocean, at world-class courses like Pebble Beach, Torrey Pines, and Sea Ranch or among the pines in the High Sierra’s for stunning mountain vistas or turquoise-blue Lake Tahoe framing your shots, or if desert tracks are your thing take in the spectacular beauty of the desert at Death Valley’s remarkable Furnace Creek or PGA West in Palm Spring. Keep in mind that with so many different places to visit, and with such climatic differences, you should plan your California vacations carefully.